At long last we finally have confirmation that Atlus' Persona-based 2D fighter will be headed to The States. Ever since Persona 4: The Ultimate In Mayonaka Arena was first announced, I've been following the game's progress with the sort of fervor usually associated with religious zealots or teenaged fans of Stephanie Meyer's Twilight books. You may have read my hyperbolic excitement here, here, here, here or possibly here. Sadly, despite my borderline-romantic affection for the as-yet-unreleased fighter, nowhere in that sizable swath of content was I able to offer solid confirmation that the game would eventually reach store shelves here in America. At least, not until now. 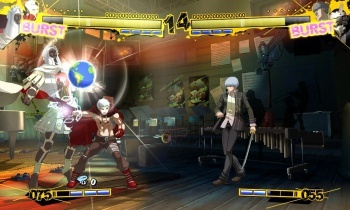 ATLUS today announced plans to bring Persona 4 Arena, the highly anticipated fighting spinoff of the award-winning Persona series of roleplaying games, to North America this summer for Xbox 360 video game and entertainment system from Microsoft and PlayStation 3 computer entertainment system. While "summer 2012" is still a somewhat nebulous release window, the very existence of an upcoming, English-localized iteration of the game is the best news I've heard all week. Likewise awesome is word that the title's official North American name is simply "Persona 4 Arena," as opposed to the decidedly unwieldy "Persona 4: The Ultimate In Mayonaka Arena." On behalf of everyone who earns a living writing about videogames, I really appreciate that sort of thing. Thanks a ton Atlus. You dudes and dudettes are the best.